This morning on the way to school, Isaac informed me that after tonight there will be two days to three weeks to Halloween. This boy loves Halloween, he really gets it. Not just the candy and costumes, but all of the darkness, too. He loves the skeletons and ghosts and ghouls. He’s going to be a devil captain (spoiler alert!) if anybody will give him nine dollars so he can buy the mask that Malcolm told him about which he’s never seen but is completely obsessed with. So, as devil-captain, he’s going to drive the boat that takes people to hell. Instead of “Land, ahoy!” He’s going to shout, “Hell, ahoy!” Not in school you’re not, I said. He knows. The other day he made an origami grim reaper first thing in the morning, and the whole way to school he said, “Death is upon us!” (just like it says in the origami book.) I have to admit, it’s a little disconcerting to hear my bright cheerful boy say things like this! (We’ve always said that his first album should be called “Little Mister Sunshine and His Dark Thoughts.”) But on our bike ride this morning everything slid into a different perspective. The spooky Halloween mist burned off to reveal all the birds doing their best Audobon poses in the raggedy glowing golden trees. The trees dying for the year and they’re more beautiful than ever, more fragrant than ever, and the birds are in tizzy getting themselves ready for winter. Halloween marks the real death of summer, the end of the harvest, a time of darkness and cold. But this is also a time when the spirits of the dead come back to visit us, when it’s easier for them to make their presence known. This is uncanny, in the sense that we can’t know it or understand it, but it’s not necessarily frightening. It’s all part of the cycle of death and rebirth, light and darkness–Isaac’s bright delight in the darkness of the day, the goblin-glow of jack-o-lanterns, the walnut trees dropping their seeds with gentle thumps in the dusty towpath, where they’ll split and rot and shed their sharp-sweet green fragrance, and someday grow again. Everything will come back in the spring, and Isaac will love that time, too. I made polenta! 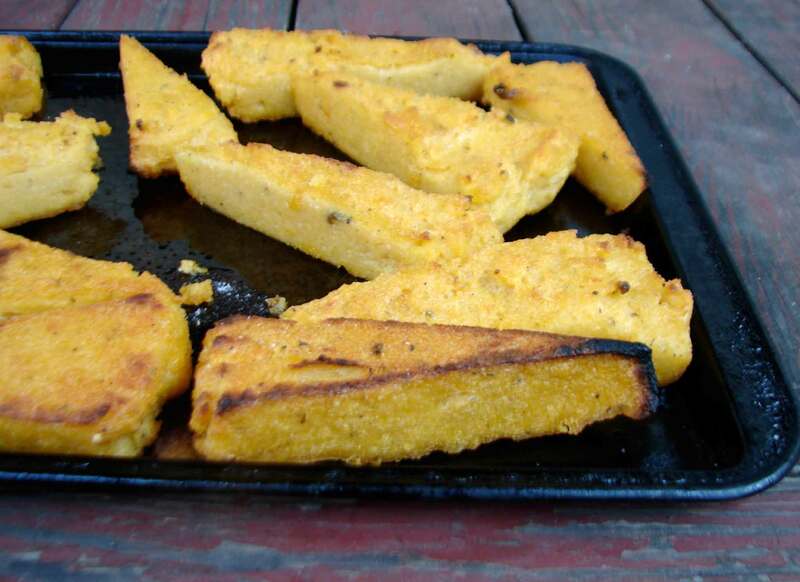 Although it’s a well-known vegetarian staple, I don’t make polenta very often. I added some smoked gouda, smoked paprika, and sage, and then I put it under the broiler until it was smoky and crispy. It wasn’t grilled ON a grill, it was grilled under a grill, in the oven. Although you could try grilling it the regular way if you like. So I cut it in wedges, broiled it till crispy, and then topped it with chard sauteed with red peppers and black beans, a pumpkinseed-goat cheese sauce and some more smoked gouda. Fancy. A nice combination of earthy, smoky, sweet and tart. Here’s Mikey Dread’s Pre-dawn Dub. It’s spooky! Make the polenta according to the directions on your polenta package. I used the quick-cooking polenta, and added less water than it called for so that it would be quite firm. When it’s nearly done cooking, add salt, black pepper, smoked paprika (about 1/2 teaspoon), 3 sage leaves, chopped, and about 1 cup of smoked gouda. Line a tart pan with tin foil, and pour the polenta in, smoothing the top. Let it cool in the fridge for a couple of hours. Cut it into wedges. Coat it generously on both sides with olive oil, and put it under a broiler until it’s crispy and starting to brown, fifteen to twenty minutes. Turn it from time to time so that it gets crispy on both sides. In a large skillet over medium heat, warm the olive oil. Add the shallot, cook and stir for a minute, add the garlic, jalapenos and herbs, cook and stir. Add the red pepper and then the black beans, chard, and a few tablespoonfuls of water. Bring to a boil, reduce heat and simmer until the chard is cooked, 10 – 15 minutes. 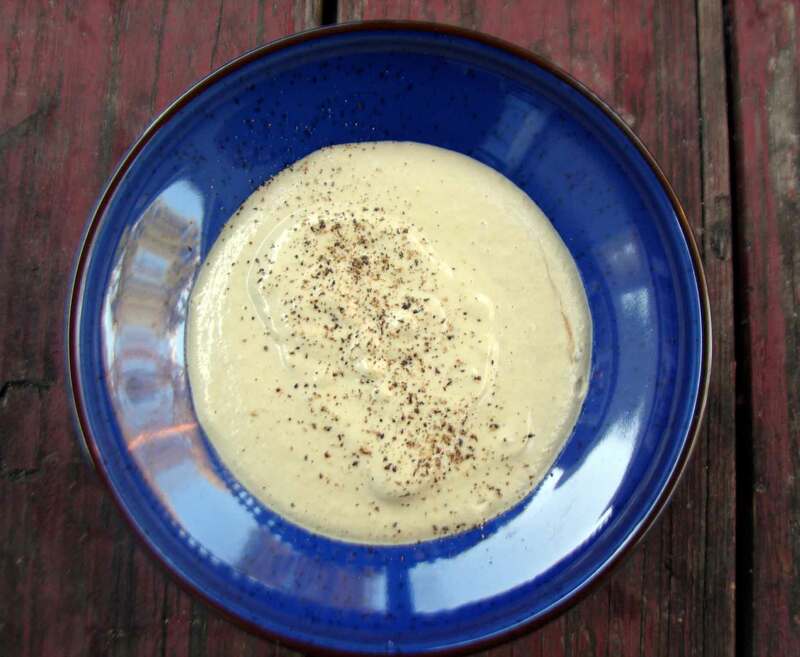 Combine everything in a food processor or blender and process until completely smooth. Add a little water to make it as thin as you like it, and continue to process until silky smooth. 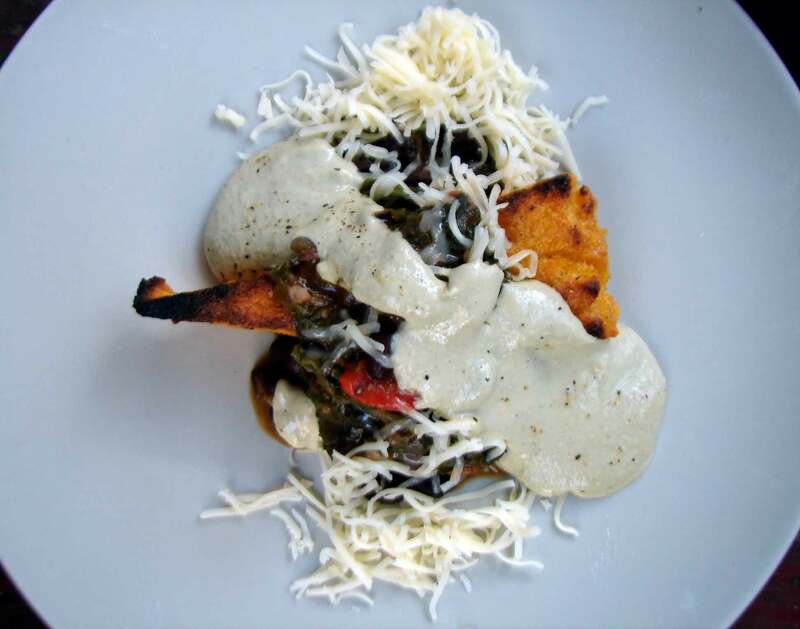 This entry was posted in beans, recipe, sauce, Uncategorized and tagged goat cheese sauce, greens and beans, grilled polenta, polenta, pumpkinseed sauce by Claire. Bookmark the permalink.